This dialog allows you to mount a disk image to the system as a virtual drive. You can then refer to the new drive by its volume letter. Images are mounted as read-only so that the original file is not altered. Thus, after mounting a VMWare disk image, for example, you can refer to it by its drive letter and perform non-writable operations upon it, like the hash dump or password lookup. However, the password reset will take no effect on the read-only drives. If the initial image file contains 2 or more disk partitions, you should set the appropriate option and show a partition number you need to mount. The following image formats are supported: AF*, BIN, DD, E01, FLP, IMG, ISO, NRG, S01, SDI, VHD, VMDK and some others. To stop using a virtual drive, just select it in the list and click the 'Unmount' button. All mounted drives will be unmounted automatically upon exit. 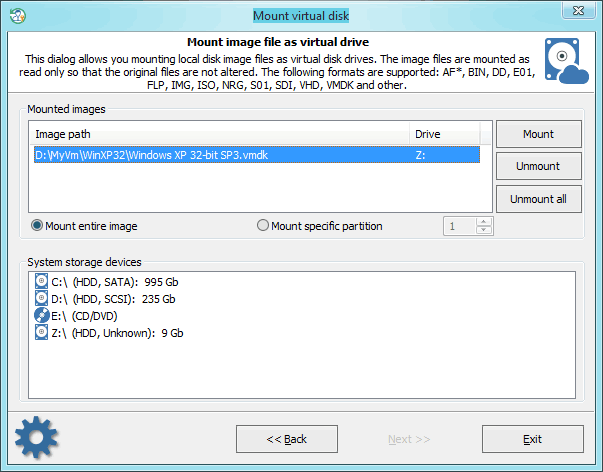 The program uses OSFMount tool to mount virtual drives. BitLocker encrypted drives should be mounted in BitLocker dialog. Be patient, mounting some image types may take up to several minutes.